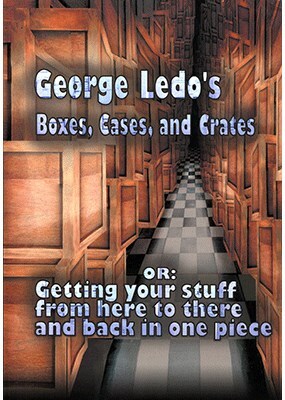 George F. Ledo studied theatrical design at California State University Northridge and the University of Massachusetts at Amherst, then spent fifteen years in the architectural field as a designer, planner, and project manager. Later he served as head of the design studio at a major scenery fabrication company, working on projects for Universal Studios, Six Flags Parks, WXXA-TV, and other clients. He has published articles in Stage Directions, Dance Teacher Now, and Haunted Attraction magazines, and is a columnist for The Magic Cafe. George and Donna live and work in the San Francisco Bay Area, where they serve as humans for two inside cats and two outside cats. From the Intro, George says: "I wanted to write about how theatrical productions have traditionally transported scenery and props, with an eye towards keeping the pieces safe as well as making them quick and easy to pack and unpack. It would be a book on ideas, not on step-by-step instructions, since I figured that anyone who builds one of these boxes or crates will come up with a hundred variations or improvements. However, as the book developed, the designer in me decided to add material on how to make and decorate small boxes, and especially on how to give them character and a "history". This material hasn't been covered much in the magic literature either, but interestingly it is covered now and then in woodworking publications. So again I wanted to offer ideas and sources, instead of step-by-step instructions repeating what's been described elsewhere. That's where the chapter on resources came in: period research, woodworking techniques, theatrical suppliers, and specialty hardware. Finally, just as I was ready to send the manuscript to the publisher, I decided to add a chapter on how to design a box, using the same basic process we use when creating stage sets or props. This process is not a trade secret, and it ain't rocket science, but it's been used for centuries and it works. And it really opens your eyes and gives you a fresh outlook on how to use your creativity and think outside of your own comfort zone. I'm hoping this book will inspire some of you--touring illusionists as well as builders and hobbyists--to look beyond the magic literature for ideas on how to make your show easier and more efficient to transport, as well as on how to create some of tomorrow's props. Fifteen chapters in this large format soft cover book, over 100 pages including gorgeous CAD designs illustrating the ideas you will need to start protecting, crating and getting your SHOW ON THE ROAD! Pages:109 - Softcover - 7" x 10" - Black and white photos and illustrations.